Highly deformable, high-efficiency powder adhesive for laying ceramic tiles. 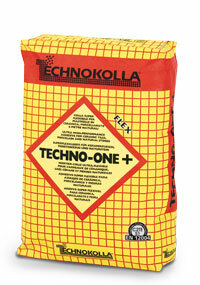 Suitable for porcelain stoneware and over-tiling. Ultra-high workability. - Fixing ceramic tiles of all types, even large sizes, on walls and floors, indoors and outdoors. - Suitable for use when high performance is required, such as: tile laying in industrial environments, swimming pools or facades. - Fixing on electric or water heating screeds. - Over-tiling on top of old ceramic tiles without the use of primer. - Suitable for fixing thin porcelain stoneware slabs. - Fixing natural stone and marble, so long as they are not affected by water. - Spot-glueing insulating panels made of polystyrene, polyurethane foam, rock or glass wool.